What is a Watershed, and Why Are Watersheds Important? Every living thing on earth depends on water. Humans, plants and animals, even microscopic creatures, need water to survive. Where does that water come from? All of the land that drains to a particular body of water ‐ a stream, river, lake, wetland, or playa ‐ is that water body’s “watershed”. The watershed collects rain and snowmelt, and delivers it to that body of water. Some of it is intercepted and used by trees and other vegetation. Some flows overland in streams and rivers. Some soaks into the soil, which filters the water as it travels downward to be stored in underground aquifers. It may re‐emerge at a spring or seep, or it can remain underground for a period of time ranging from days to thousands of years .In New Mexico, with its arid climate, the value of water is more obvious than in other wetter environments. Our communities are usually clustered near a dependable water supply. We collect and divert surface water to irrigate our crops and water our livestock. We use wells and pumps to obtain clean water from the aquifers. We are attracted to the green spaces near water for recreation and refuge. It’s easy to see how watersheds are all about connections. Weather conditions in the uplands dictate the amount and timing of flows from headwater streams. Flood waters are connected to – in fact, essential to – floodplains, which in turn supply food and other resources for humans and animals. Rivers connect upstream and downstream water users, and often connect surface water to groundwater. These connections apply to water quality as well as to water supply. What happens on the earth’s surface affects water quality in rivers, lakes, and the ocean, and sometimes can impact groundwater. Water quality is directly connected to wildlife habitats, and to our own quality of life. We all live in a watershed. What we do has in impact, positive or negative, on the health of our watersheds. Since our families and communities depend on the water these watersheds provide, shouldn’t we take care of them? Upland forests and woodlands are found at the top portion of our watersheds. 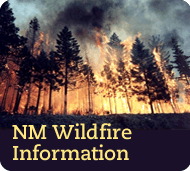 New Mexico’s 19 million acres of forested land encompass 500,000 acres of spruce‐fir forests, 2 million acres of mixed conifer/aspen, 5 million acres of pine‐oak forests, and 11 million acres of piñon‐juniper woodlands and savannas. Natural disturbances or management activities in the mountain forests and woodlands could eventually impact the ecosystems and water users at lower altitudes. Riparian forests, commonly known as “bosques” in New Mexico, form long, narrow ribbons of green space that provide valuable natural resources as well as critical wildlife habitat in otherwise arid environments. Despite the fact that they comprise less than 1% of New Mexico’s land area, a large proportion of the state’s plant and animal biodiversity is concentrated in bosque ecosystems. The health of the bosque is closely tied to the overall health of the larger watershed above it and to the river that flows through it. The landscapes between the uppermost watershed and the river bottoms in New Mexico cross many ecosystems from alpine tundra through aquatic environments, and include forests and woodlands, grasslands, shrub lands, and desert ecosystems. Each one has characteristic landforms, vegetation, and wildlife communities in equilibrium with the conditions under which that ecosystem evolved. When those conditions change due to natural variations or because of human manipulation, it can affect the land and water not only in that part of the watershed, but upstream and downstream as well. Forests and woodland ecosystems cover 28% of the state. At the highest elevations are treeless alpine tundra. From higher to lower elevations, forests in New Mexico typically transition from mixed conifer and aspen, through spruce‐fir forests to ponderosa pines or mixed pine‐oak forests. In the lower, dryer foothills, pines give way to pinon and juniper woodlands. Thirty‐seven percent of New Mexico’s surface area is classified as grassland. Much of that is in the eastern plains, with the rest distributed between the non‐forested parts of the northwest plateau, the central valleys, and southwestern bootheel. Shrub‐scrub vegetation typical of desert covers 18% of the state. Much of the southern borderlands are part of the Chihuahuan Desert, while the far southwestern corner of the state is in the Sonoran Desert. Intermediate zones dominated by shrubs are found between the mountains and grasslands, and between the grasslands and true desert. These ecosystems and the natural resources they provide ‐ water, wood, crops, range, minerals, and unique wildlife habitats ‐ are crucial to New Mexico. Surface water, because it is uncommon in this landscape, is very precious. Riparian zones are the areas bordering rivers and other bodies of surface water. They are defined by a “green zone” with a characteristic suite of plants, such as cottonwood and willow, which stay green long into the summer months. Groundwater is usually found at shallower depths in riparian zones than in the surrounding landscape. Floodplains are the low‐lying areas of land where floodwater spreads when a river or stream overtops it banks. Wetlands are areas of land where soil is saturated with water at least part of the year during the growing season. Plants in wetlands and cienegas are adapted to living in soil that has water instead of air in its pore spaces. Examples of New Mexico include wet meadows and marshlands. Cienegas are wetland‐like areas that are spring‐fed and do not rely on precipitation. The extra moisture in wetlands and riparian zones, combined with the abundance of vegetation, creates a mat of decomposing material on top of the soil. It is often damp because the water table is at or near the soil surface. This organic‐rich layer aids in conserving moisture. The vegetation and spongelike quality of soils in wetlands, floodplains and riparian zones protect surface water in several ways. Often, interactions between shallow groundwater in the riparian zone and surface water in the river regulate stream temperature in ways beneficial to fish and other aquatic creatures. Streambank vegetation helps cool surface water temperatures. Riparian vegetation along streambanks and in floodplains reduces the velocity of floodwaters, lessening the erosive force of the flood and capturing nutrient‐laden sediment. Soils in this area absorb water during the wet seasons and slowly release moisture into the stream. This buffers the effect of peak runoff and keeps streams flowing longer. These areas can capture and filter surface runoff that flows from higher ground. Live vegetation, and the absorbent mat of accumulated plant litter and humus helps to trap sediments before they reach the river. Soil microbes that thrive in this moist environment break down chemical pollutants like hydrocarbons, further protecting water quality. Riparian areas and wetlands are especially valuable in or downstream of urban areas. Their natural functions can counteract the effects of concentrated runoff from pavement and buildings, protecting water quality and the river channel itself. In New Mexico, floodplains, wetlands, and riparian areas provide important habitat for numerous species of birds, mammals, amphibians and reptiles. The water bodies that support these critical areas are home to the state’s native fish. Mexico. Playa lakes form in depressions and generally have their own local watershed. Most playas form in response to precipitation, but some in New Mexico are supported by shallow groundwater. Open water appears in precipitation‐driven playas after rain events. In many places, playas recharge a groundwater aquifer, but very slowly since it depends on rainfall. Arroyos and washes are desert drainage ways where water flows after a heavy rainstorm, but which are otherwise dry. Arroyos usually indicate that there is no local groundwater connection to the valley bottom. However, they sometimes mark areas where groundwater is closer to the surface than in the surrounding landscape. Infrequently, these channels may have sections that serve as ”recharge windows” where a portion of the surface flow seeps down through the streambed to the groundwater aquifer. What is a “WUI”? WUI stands for “Wildland‐Urban Interface”, a term coined in the 1990s by fire scientists to broadly describe places where human populations bump up against, and merge into, undeveloped wild lands. WUIs are irregularly‐shaped areas that surround settlements which grew up near water and other important natural sources or around transportation hubs. WUIs tend to be located along shorelines and river corridors, near the base of mountains, and in lands that form the forest fringe. On the plains, WUIs extend into grasslands or arid shrub lands. WUIs are important for several reasons. They tend to be in ecologically sensitive landscapes. They are subject to both natural and human‐caused disturbances. They connect us to the natural environment. Since people usually settle in areas with easy access to water, the WUI interface zone is often near a river, lake, or spring. These riparian environments have great intrinsic value. Both humans and wildlife are attracted to other places where one type of environment blends into another, like the fringe between forests and meadows or between woodlands and prairies. These ecological fringes provide a wider variety of environmental conditions and greater diversity of resources. WUIs that surround settlements in riparian and fringe environments are vulnerable to damage, such as pollution or fire, which can result from human activities. At the same time, communities adjacent to these wild lands may be more exposed to natural disturbances like floods and wildfire. WUIs are in the buffer zone between cities and towns and their surrounding environment. Sometimes they are set aside as parks or open space because of their ecological and recreational value. Since WUIs are, by definition, the place where development blends into undeveloped landscapes, they also provide people with the most opportunity for experiencing the natural world close to home. WUIs form the transition between the human‐built and natural environments in our watersheds. Although they are not usually listed as ecosystems in their own right, urban environments and the surrounding wildland‐urban interface can have a profound impact on the ecosystems in which they are situated. Dense populations create unique situations with respect to watershed health, stemming from our need to secure adequate drinking water, waste disposal, and storm drainage. They also provide some of the best opportunities to make an immediate difference. Urban forestry, once limited mainly to parks and street trees, now looks at all the ways we can care for the natural resources in developed areas within our watersheds. Urban forests are becoming valued as essential parts of our communities’ green infrastructure, positively contributing to their water quality, air quality, stormwater management, water harvesting, microclimates, and wildlife habitats.